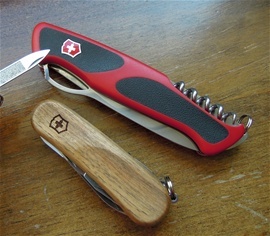 As far as i know all the new modifications are done to fit the new Victorinox product line. I have talked much about the Wenger handle design and the evolution on the Rangers. Some enthusiasts did mention that the Wenger design on the 130mm Ranger knives was too thick or bulky. This depends on what model and how many functions it got. Obvious the thickness of the functions and construction and the handle scales will influence the ergonomics and comfort of the use. The philosophy also included the design of the evolution and the hidden sideliners for ergonomics, comfort, safety and design. 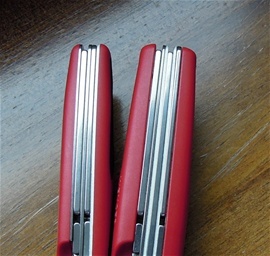 The Victorinox philosophy on knives is the use of handle scales that follow the sideliner and are even with them. The hidden liners are more a Wenger philosophy and it is a part I have discussed some here. It does not necessarily mean only them. When I hold in my hand a Wenger RangerGrip 61(not on the picture) and the new Delémont 61 then there is a distinct difference in the feel of ergonomics and comfort. The use of the Grip inlays works very well with the new and the comfort is there. Both work but are different and the new is obviously more a Victorinox philosophy but again I do not know for sure that it is only their choice. I can only go by my feel and it is for certain a different philosophy. I have talked some before on how the hidden liner design influences different aspects of a design and comfort. It is for me interesting to see and do my own research on the knives in hand. What I can say is that the Wenger handle design has seen use on all kinds of different knives from 2007 and until 2013 with success. The use of hidden sideliners influence the comfort in a way you will only notice fully when used. Wenger incorporated the comfort = safety. The development of the design itself became a trademark for modern SAK evolution. I have talked about the Wenger design when you use the other functions and especially the push lock screwdriver is influenced by the new design. The Wenger type had an ergonomics that help the hand or thumb when pushing down. The new is a bit thinner and with a different angle that causes a different feel. I do like the new knives and they are formidable but the differences are much larger than I thought. It is little or no point of going back a forth on what is the best. I see the new knives as a Swiss product. It is very strange as well because all my research fit very well and it does show interesting new aspects. The products are now changed and we can only wait and see the development. There also differences in the one hand opening but only a minor one that makes the new design more comfortable to open. Then to my most important factor and this is how the Victorinox quality is on large sturdy knives. If I should mention the 111mm services range then I can tell for sure that they are tank built. Victorinox got a very developed quality on such knives and the uses of them. If Victorinox have had in mind this quality then I would not believe the new Delémont knives are less. Wenger did a superb job with the design and quality on the 2007 and 2009 Grip New Rangers and these new hybrid knives may be more interesting than most would know. Then again it will be interesting to see in the future if Victorinox will use the hybrids as knives that could fit services or they will use their own 111mm Services Range and the New Soldier types only. Evolution design started on the 85mm Wenger in 2004 and this is a bigger success when it comes to the ergonomics complete feel. The new hybrid 85mm knives does not have hidden liners anymore just as the 130mm category. The cosmetic and design is better on the Wenger. The new hybrid is not as beautiful in different angles. Hidden liners are something Wenger has used a long time before 2004! The evolution represents the complete picture. Some of the new changes disrupt this evolution. 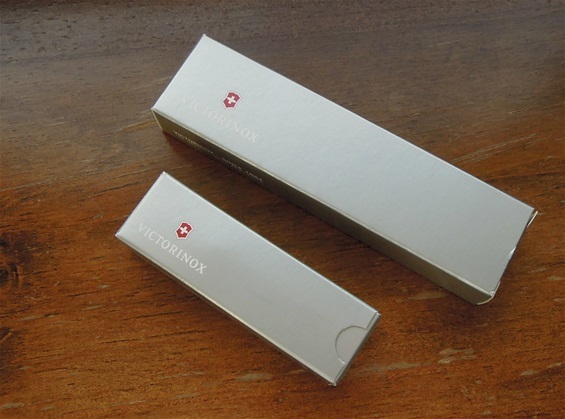 Victorinox incoroprated the size used on the 84mm for the 85mm. I have not used these two knives and i have not removed the scales or done anything other than doing the first research on them, this done to see the modifications and changes. It is a hybrid product. I am sure that Victorinox incorporated the company values into them. The changes are bigger than I thought. If you look at the center pin on the New Victorinox Ranger then you will see that the pin is now a different color and that is brass. I have tried to find what Wenger used. The Wenger introduction of the new 130mm category represented a design that is one of the absolute best ever. A super modern philosophy with the history incoroprated! These two knives are going in my collection as collectables because they are the first that entered Norway. This mean i want to keep them fully intact as they came. I really do recommend getting them because there is much legacy from Wenger in them. The boxes and manuals are now Victorinox too. When this Company put their stamp on the blade and the Company emblem on the scale then this represents a Victorinox product. It is a bit sad as well becasue the Wenger product was superb already. The new knives made by Victorinox in Delémont are already well known on the market. It is time for a follow up article on the new products. 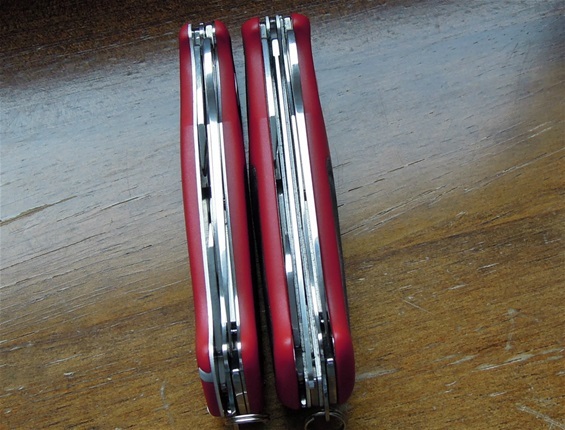 Today I will discuss the 130mm Ranger knives made by Victorinox. I will mention again some historic facts and development. 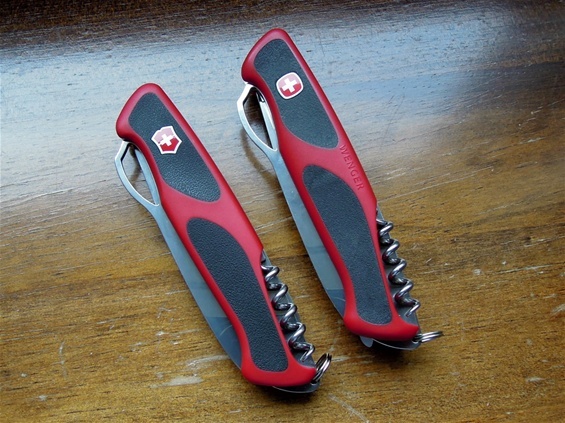 I have discussed some about the two Brand philosophies used in the history of Swiss Army Knives. It seems this is clearly seen on the new products called Delémont knives. One of the key features by Wenger was the combination “flexibility and hardness on the steel” I have no doubts that they upgraded the steel when they introduced the New Rangers in 2007. The steel is durable, corrosion resistant, easy to sharpen, get very sharp and it is very flexible. In other words it was advanced and a rather unusual steel in the knife world. I have tested every aspect of that particular steel. I have never gotten the complete information on the HRC that most likely is 56-58 on that scale. What is most interesting is the strong flexibility on this steel. This is best felt when force is applied. With the New Rangers in 2007 Wenger also introduced stronger rivets. There are absolutely no wear or any change on the tested knives. The New Rangers was a perfection and completion of The Brand philosophy on a product for the outdoors that represents the ultimate achievement. I have gathered some information from various sources on the new products made by Victorinox in the Delémont plant. Immediately I can say that we again have the two philosophies involved and one ended. The clear changes for the eye is the awl, can opener, the more slim scales, locking mechanism and the introduction of toothpick and tweezers. There are also changes on the liners, dividers and other details. I am rather sure that the stainless steel used on the knives, functions and springs are not the same. The rivets are also changed. There is no doubt that the new SAKs made by Victorinox are very well made and they are interesting. If I would have received a question on what is better? The answer is simple. The Wenger New Ranger and the Victorinox Ranger are equally best. They really cannot be compared because they represent two different philosophies made to have the best functionality for the same tasks. That may sound complicated, what I mean is what a company feel is the best for the outdoors and that includes traditions, history and knowledge. What is left of the 130mm knives made by Wenger is the main advanced design. Victorinox have the best knowledge on the steel and materials used by the Ibach factory and they are world class. Wenger had the best knowledge on the stainless steel and materials for their philosophy. Wenger is now gone. The New Rangers by Wenger are historic knives and they achieved perfection. Ibach and Delémont are now really the same and this includes most materials used. There are also small changes on the grind for the main blade that influence the cutting performances; this is also a philosophy difference. I have studied the two Brand philosophies to the extreme and do not forget that they have been competitors and this is now gone. The Wenger New Rangers hit the market in Norway with big success and especially the Hunter tools. They competed and were equal to the best multi-tools in the world for the outdoors. The knife blades with steel were above the others. It is time to move on and Wenger SAKs are history and this opens new collectability on them. My latest Wenger knife is one more of the Pink scaled RangerGrip knives and they were introduced late in the history and they are collectable for the color alone.